Kadena striker Adrianna Gomez tries to settle the ball between Naha Commercial defenders Ai Murayama and Michi Irei during Saturday's Okinawa girls soccer match. The Panthers won 5-0. TOKYO – Things looked mighty good Friday for Kubasaki on the first day of its two-day baseball road-trip to Tokyo. Kyle Powell just missed a no-hitter in the Dragons’ 6-1 win over Nile C. Kinnick, and Samuel Williamson and Camron McCall each had two RBIs in a 4-1 victory over Yokota. But a familiar foe made life miserable for Kubasaki on Saturday – four-time defending Far East Division I champion American School In Japan. The Mustangs quickly broke out of the gate in each game of a Saturday doubleheader, then held off late Dragons charges to sweep the twin bill 7-5 and 5-2. “They’re definitely still the team to beat,” Dragons coach Randy Toor said. “They have good young players, some young arms, they’re solid and they put the ball in play. They don’t strike out much. They’re very patient and selective with pitches." Errors didn’t help the Dragons, who committed three in the opener, helping the Mustangs pull ahead 7-1, helped by two Sho Flores RBIs. The Dragons rallied for three runs in the fifth inning and one in the seventh, “but we came on too late for a team like that,” Toor said. The same issue occurred in the nightcap. ASIJ burst in front 3-0 in the bottom of the first inning and increased it by two in the fourth. “The first three or four innings, we really weren’t there. We came out flat,” Toor said. Things went much better for the Dragons on Friday, when Powell combined with Adam Garlick’s 3-for-3 performance with two RBIs against Kinnick, and Jon Palmer got the win in relief to couple with Williamson’s and McCall’s run production in the win over Yokota. Stark said he sees a “very competitive” Far East Division I Tournament, May 21-23 at Seoul American. “If we improve the way we should, we’ll be right up there with them,” Stark said of Kubasaki and ASIJ, among other teams in D-I. YOKOTA AIR BASE, Japan – Late last month, Robert D. Edgren baseball had just seven players at yet another indoor practice – snow at Misawa Air Base tends to keep the team indoors until late March – and coach Brett Lehner sent word that the Eagles would not field a team this season. But fortunes changed, and enough players came out for the team that Edgren was able to make a late-scheduled road trip for a Saturday twin bill at Yokota. Both games were one-sided – the Panthers outscored the Eagles 26-1 – but just getting on the field was a victory, Lehner said. Most of Edgren’s other teams except girls soccer took a bus to Tokyo for weekend games, and “they had room on the bus for us, they (Yokota) had an opening in their schedule, so it worked out for both of us,” Lehner said. Days after the team folded, Edgren gained two players via the PCS Plane, giving it nine, which was enough for the road trip to Yokota. Zama is due to come up to Misawa next week, when Lehner says he hopes to have 11 players. “That’ll be a good test for us,” Lehner said of facing the Trojans. MARINE CORPS AIR STATION IWAKUNI, Japan – Chadwick International may be a small school in the Korean-American Interscholastic Activities Conference that not many outside of Korea have heard of, but they've earned the attention of Yokota boys soccer coach Trent Anderson and his team. The Dolphins breezed to the championship Saturday in the Matthew C. Perry Cup soccer tournament, blanking Anderson’s Panthers 3-0 in the final. “They were in another league by themselves playing in that tournament,” Anderson said of the Incheon-based Dolphins. They were led by tournament MVP Kaffie Kurz and Golden Boot winner Chris Lim, who led all scorers with six goals. Panthers junior Renyck Robertson was named the tournament’s Outstanding Goalkeeper. The tournament gave the Panthers “an opportunity to work on different formations,” Anderson said, and see teams with a higher “soccer IQ” such as Chadwick. “If we can defend well against teams like that … the preparation we can get from facing that team is awesome,” Anderson said. 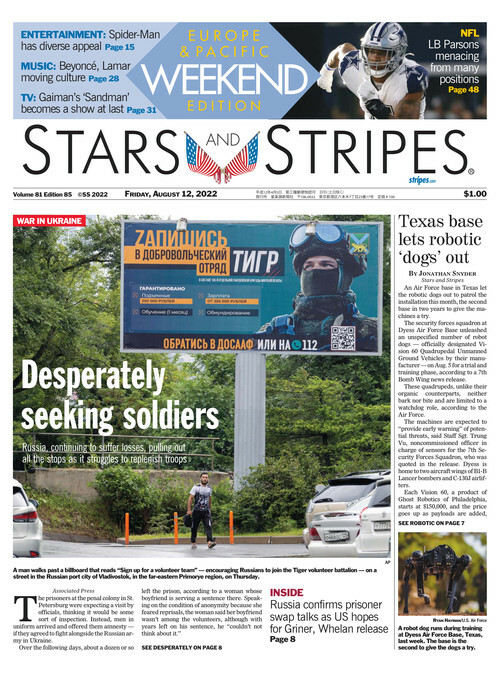 CAMP HUMPHREYS, South Korea – In meets past, Humphreys boys track and field team might top the team standings one week and the girls another, but they never managed to do it at the same meet until Saturday. The Blackhawks edged out Seoul American 177-174 for the girls team title, while the defending Far East Division II champion boys won in a runaway, outdistancing Yongsan 175-117. Sh’Voda Gregory Jr. won the 300 hurdles and also ran the 400 and 1,600 relays for the Blackhawks. Cullen Areniego won the long jump and 110 hurdles. Taliyah Calloway won the girls 100 and helped win the 400 relay and Precious Harris won the 200. Yongsan's Samson Dakuwaqa won the boys shot put and discus, while Seoul American’s Alyse Neal long-jumped 5.30 meters, matching the mark she jumped to set the Far East meet record last May. Like father, like daughter. Meridean Duarte, a freshman, has become the latest Zama girls newcomer to show she can fill the back of the net, scoring five times in Saturday’s 7-1 win over Seisen. She has eight goals this season. How much better she can be “depends on her and how much desire she has to improve her game,” said her father and coach, Manny Duarte. The rebuilding Daegu girls soccer team (0-2-1) got a huge lift Saturday when the Warriors battled Taejon Christian to a 0-0 draw. Senior keeper Neena Ibit had 13 saves, which gave her 30 for the weekend, coupled with 17 Friday against Yongsan. “We’re improving every day; I think we need a win to truly realize it,” Ibit said. Seoul Foreign got its usual victories over Humphreys soccer teams, but not by the vast margins to which they’ve been accustomed in the past. On the Crusaders’ home turf, SFS edged the Blackhawks girls 1-0 and the boys 2-1. Kadena striker Phoebe Bills charges past Naha Commercial goalkeeper Shina Hamamoto toward the ball during Saturday's Okinawa girls soccer match. Bills did not score on the play. The Panthers won 5-0.